Nomos announced the Swing System, its in-house escapement, at Baselworld 2014, one of the key steps in its vertical integration. 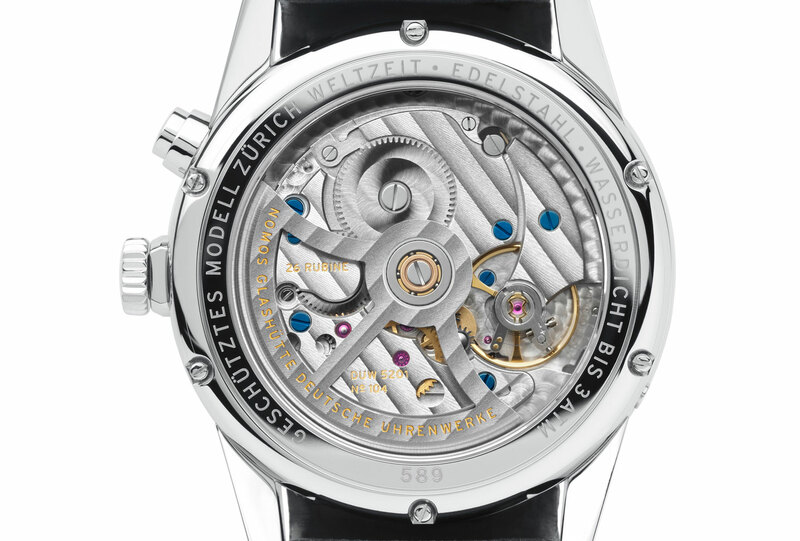 Now the Nomos Swing System been put in an automatic watch for the first time – it was previously used only in manual wind movements – inside the new Zürich Weltzeit nachtblau (“World-Timer Night Blue”). The Zürich Weltzeit shows local time on the main hands, and home time on a disc at three o’clock, just beside a red home icon. A button at two o’clock advances the local time and cities disc by one hour intervals. While the Zurich World-Timer was in the Nomos line-up before, this is the first time it is offered with a galvanised, dark blue dial, and more importantly, the in-house escapement. Based on the Nomos Epilson automatic, the DUW 5201 inside features the Nomos Swing System – a balance wheel, hairspring, escape wheel and pallet fork – all made in-house by Nomos. It has a power reserve of 42 hours. The Zurich World-Timer has a 39.9 mm steel case and like all Nomos watches, is fitted on a shell cordovan strap, made from a sub-cutaneous membrane from the hindquarters of a horse. 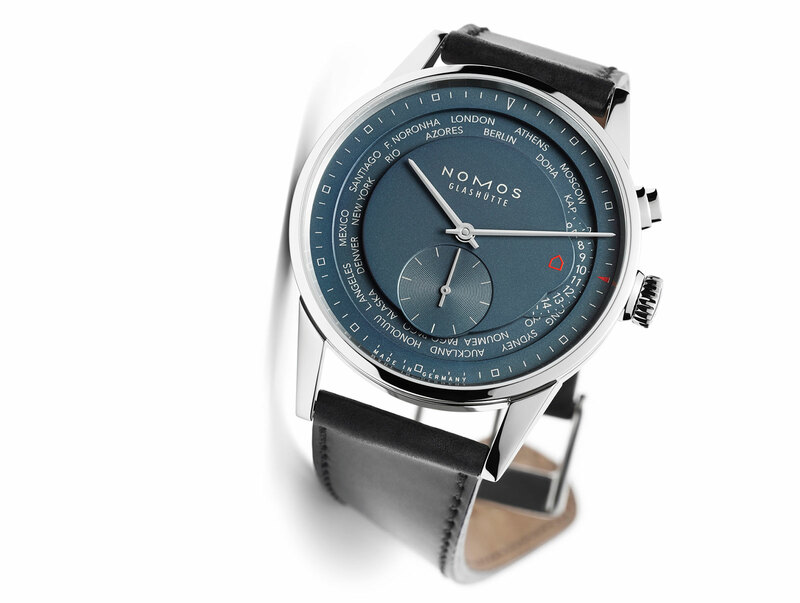 Available starting October, the Nomos World-Timer True Blue will be priced at US$6100 or €4200. 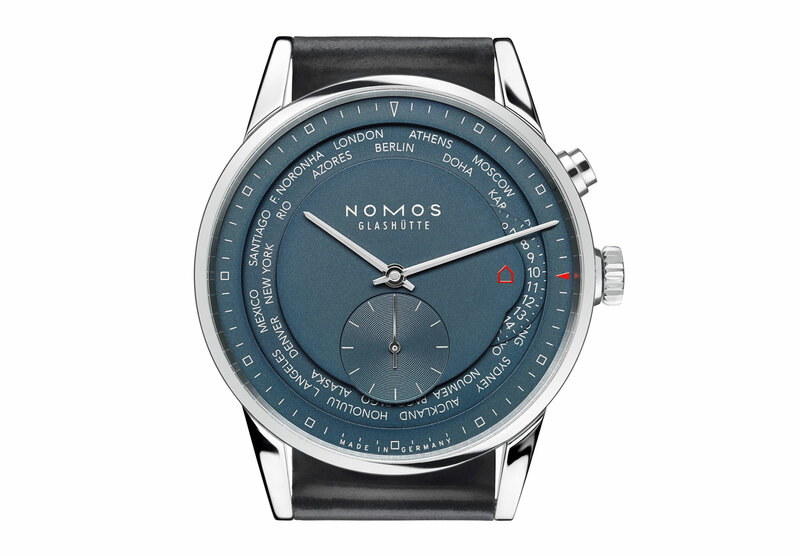 In keeping with Nomos’ philosophy of reasonable pricing, this is the same price as the existing Zurich World-Timer without the Nomos Swing System.